We’re on the brink of spring, a period of floral regrowth and faunal fecundity. And that means the humble egg will once again bear its annual symbolic weight on seder plates and in Easter baskets worldwide. Eggs and all the potential for new life they represent, you see, are the ultimate seasonal metaphor. As luck would have it, they are also delicious. So, in the spirit of tradition—Judeo-Christian and beyond—here are four places to get your hard- and soft-boiled egg fix in Buffalo. At Falley Allen, chef Christopher Daigler’s popular eggs, likewise deviled, take inspiration from Americana’s quintessential food vice: the Big Mac. Just don’t expect to find them laced with ground beef. Instead, the vegetarian dish relies on house-made Thousand Island dressing—a stand-in for the Golden Arches’ iconic special sauce—to bind and enrich the yolk, while naan bread plus a garnish of slivered cherry tomatoes, iceberg ribbons, minced pickles, red onion, and white and black sesame seeds complete the sandwich mimicry. Historically, to devil something was to prepare it spicy or heavily seasoned. At Toutant, the fried deviled eggs conceived by chef Joseph Fenush embody that original meaning. The dish requires a labor-intensive process that starts with marinating hard-cooked, de-yolked egg white halves in Cajun-spiced buttermilk. Upon order, the whites get breaded in a corn-based assortment of gluten-free flours and deep fried for a very precise 75 seconds. While they’re still warm, the kitchen seasons the whites with hot sauce-infused Maldon sea salt and fills their hollows with a mousse of yolks, mayonnaise, mustard, pickles, hot sauce, cider vinegar and a few undisclosed ingredients Fenush called “umami-heavy elixirs.” Each egg is then garnished with paper-thin slices of local chili peppers, house pickled at the height of the summer season. A flurry of finely grated koji-cured egg yolks finishes the dish. At this 44-tap craft beer bar at the heart of Allen Street, pub food is the name of the game. In line with that concept, chef Tony Martina borrows from the battered-and-British food canon to bring you not deviled but Scotch eggs. They’re soft boiled, encased in a mild pork sausage, coated in breadcrumbs and fried to amber brown. The finished product, served with maple-bacon aioli, resembles an empanada in shape and heft, but don’t be tempted to bite in end first. 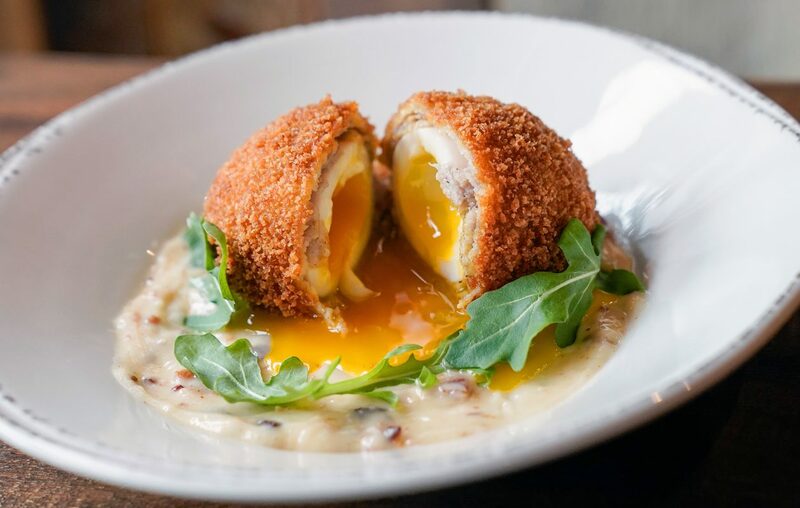 This Scotch egg experience calls for a cross-sectioned approach—and a pint of saison, per Martina—to best appreciate the simple joy of its interior runny yolk.